Do you like Thai food? Would you like to learn the secrets of Thai cooking? There are many Thai Cooking Classes in Bangkok from small local kitchens through to five-star hotels. Most classes are a half or full day and include the fundamentals and techniques as well as a chance to prepare and cook at least 4 dishes that you choose from a menu. 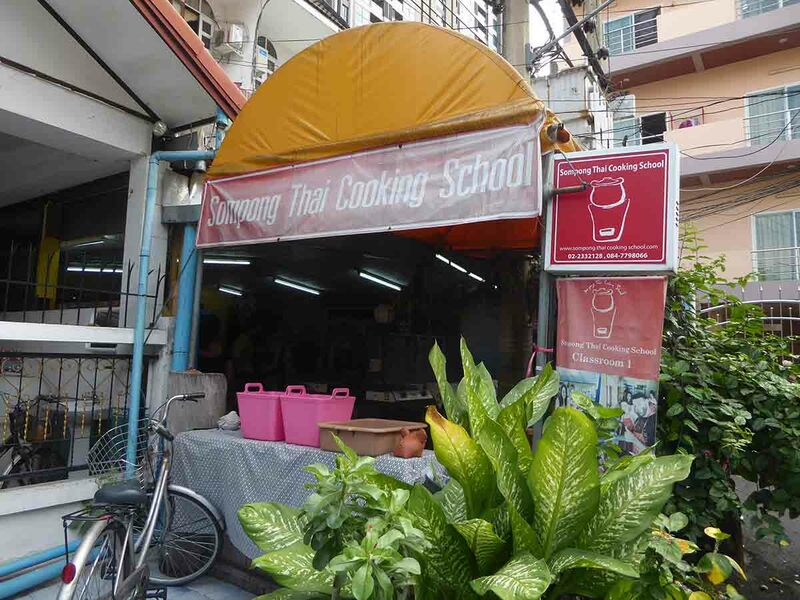 The best cooking classes in Bangkok take you to a local market to source your ingredients. After cooking you will get to sample what you’ve cooked and even a certificate. The cost of a lesson runs from 1000 to 4000 baht depending on the School and length of the class. You can also include a rustic cooking class as part of a day tour to Damnoen Saduak Floating Market, Khao Yai National Park, Amphawa Floating Market and Ayutthaya. The Oriental is Bangkok’s most famous hotel and it’s cooking school is one of the most upmarket and expensive in Bangkok though quality and instruction by fully qualified chefs assured. 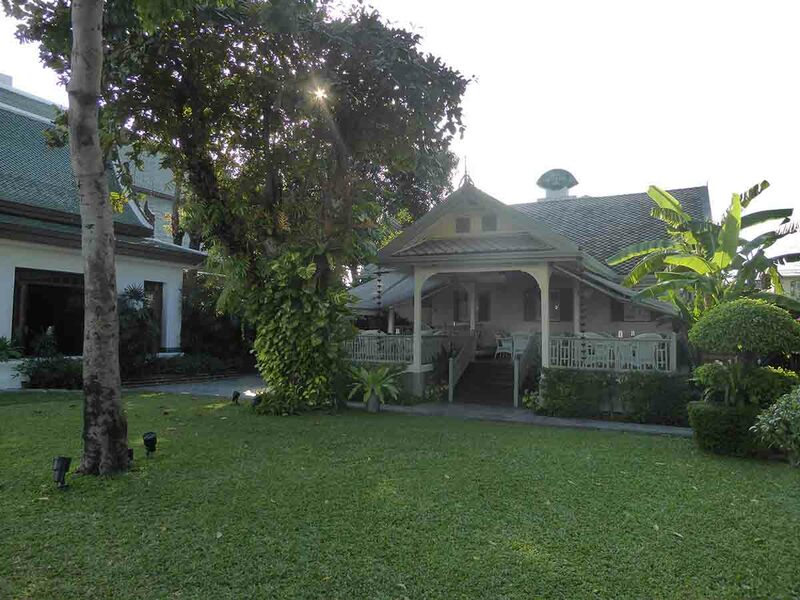 The classes take part in an old antique wooden house in an attractive setting just across the river from the hotel. The school offers three study options. The first option is Hands-on cooking and authentic Thai lunch which teaches you how to prepare and cook four authentic classic Thai dishes which you later get to eat for lunch at the hotels riverside Sala Rim Naam restaurant. The menu is different each day and changes every three months. The lesson price is 3733 baht per person and runs four times a week from 09.00-13.00 on Monday and Wednesday – Friday. The second option is Hands-on cooking and morning fresh market trip where you go to a local market and shown how to buy the freshest ingredients for making four dishes from a fixed menu. As before you learn how to prepare and cook each dish and then get to eat your creations for lunch. The lesson price is 4160 baht per person and runs four times a week from 09.00-14.00 on Saturday and Sunday only. The third option is a private lesson (max 2 people) with Chef Narain and his team using a customized menu. The lesson price is 5864 baht and is available in the afternoons from 14.00-17.00 on Monday and Wednesday to Friday. Every student receives a certificate and a souvenir apron. Location: The Oriental Hotel, 48 Oriental Avenue, Soi 38 Charoen Krung Road, Bangrak. Getting There: BTS Saphan Taksin Station (exit 3). Turn left onto Charoen Krung road and take a taxi to the Oriental (about 40 baht). The Blue Elephant is a famous Bangkok restaurant specializing in Royal Thai Cuisine with branches in worldwide locations as well as a brand of Thai cooking products such as pastes, spices, sauces and more. 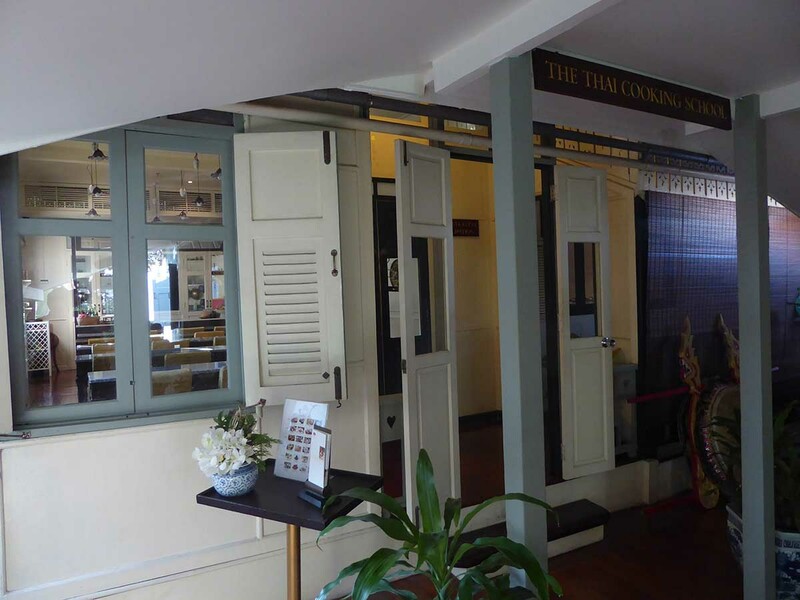 The Bangkok restaurant is in the colonial style Thai Chine Building, built in 1903. The Blue Elephant Cooking School offers daily cooking classes held twice a day in the morning and afternoon with the aim of teaching you how to cook Thai food at home. The morning class runs between 08.45-13.00 and includes a visit to a local market with your instructor to learn how to choose the perfect ingredients. The class follows, where you learn to prepare and cook four dishes from a set menu. There is a different menu for each daily session and day of the week. After the class, you get to eat your culinary creations in the Blue Elephant restaurant. The cost is 3296 baht per person. The afternoon classes run between 13.30-16.30 but there is no market visit though instruction in fruit carving is in the schedule. The cost is 2943 baht per person. There is a discounted rate if booking more than one class. Private classes are also available. A private half day class costs 5884 baht (4 dishes), and a full day costs 11770 baht (8 dishes). The classes feature experienced, knowledgeable instructors in fully equipped classrooms. On completion of the class, you receive a certificate, cooking set, and souvenir apron. 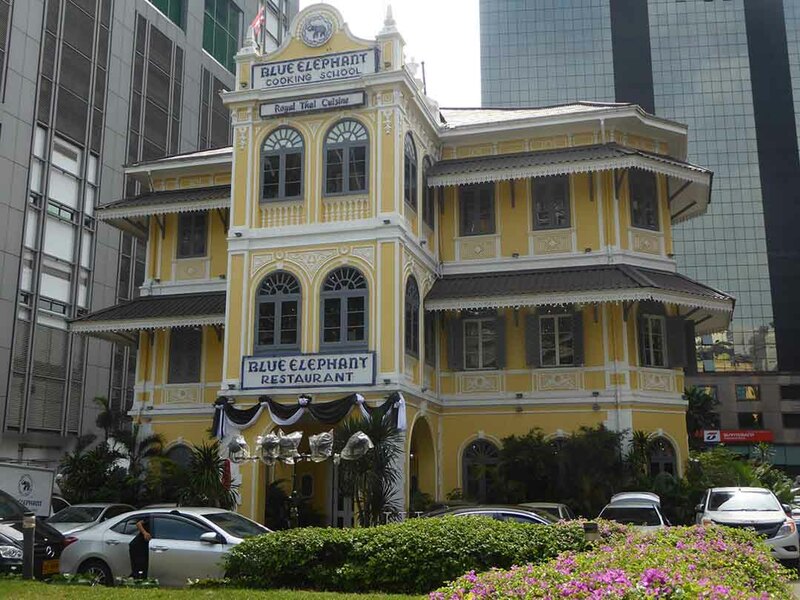 The Blue Elephant is conveniently located just yards from Surasak BTS station. Location: 233 South Sathorn Road, Yannawa. Getting There: BTS Surasak Station (exit 2 or 4). Maliwan Thai Cooking Class is near to Khaosan Road and offers classes for both adults and children (over 12 years old), beginners and experienced cooks. There are 2 classes every day, in the morning from 09.00 to 13.00, and in the afternoon from 13.30 to 17.30. There are evening classes but not every day. The evening classes run from 18.00 to 20.30. The morning and afternoon classes include a Tuk-Tuk ride to a local fresh market with the instructor to find and shop for the cooking ingredients. The classes cost from 1075 baht per person to 1575 baht per person including all ingredients, refreshments, and recipes. Each class prepares and cooks between 4 and 6 dishes with different menus for each day. Class sizes are small with a limit of 8 people. There is also a customizable option where you can choose the dishes that you want to cook as well as a vegetarian menu option. Private classes are also available for 1-8 people daily between 09.00-20.30, with a choice of over 40 dishes to choose from. The price depends on the dishes selected. The classes end with a meal where you get to eat the food you have cooked. Getting There: Walk from Khaosan Road (police station end). Turn right in to Chakrapong road, then take a right into Soi Kraisi, look for a Chinese temple and walk into a small alley next to the temple, then turn right at the junction. Maliwan is a 4-story dark grey and brown building. 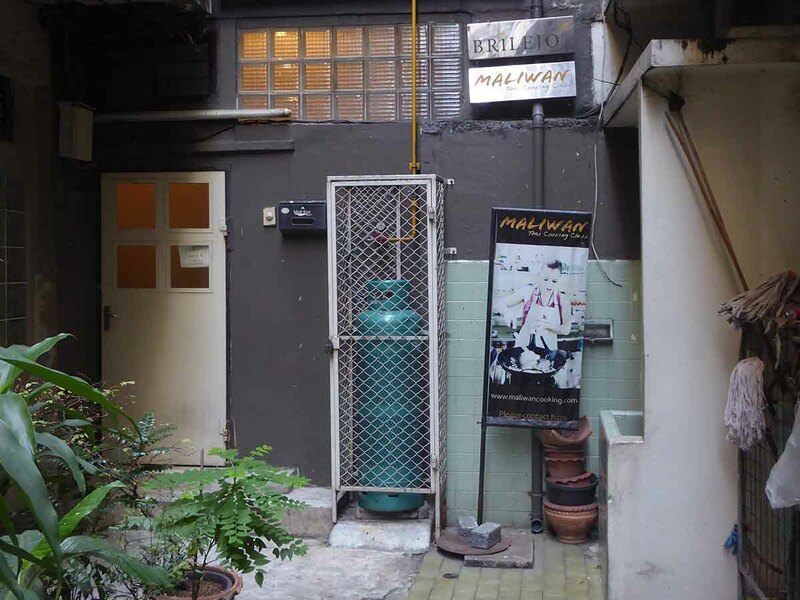 You can book a class at Maliwan below. Sompong Thai Cooking School is a home-style school set in a traditional home setting as opposed to a big restaurant or hotel kitchen. There are daily classes from 09.30 to 13.30 daily. The class includes a visit to a local market where you will learn about Thai ingredients, before learning how to make pastes and preparing and cooking the dishes on the daily menu. The menu features 5 different dishes each day. Each student has their own cooking station and equipment. The class ends with lunch where you get to eat the food you have cooked. There is also a special vegetarian only cooking menu and class available on demand. The cost is 1000 baht per person including all ingredients, refreshments and a full-color Thai cookbook with recipes. Location: 31/11 Silom Road Soi 13, Bangrak. Getting There: BTS Chong Nonsi Station (exit 3). 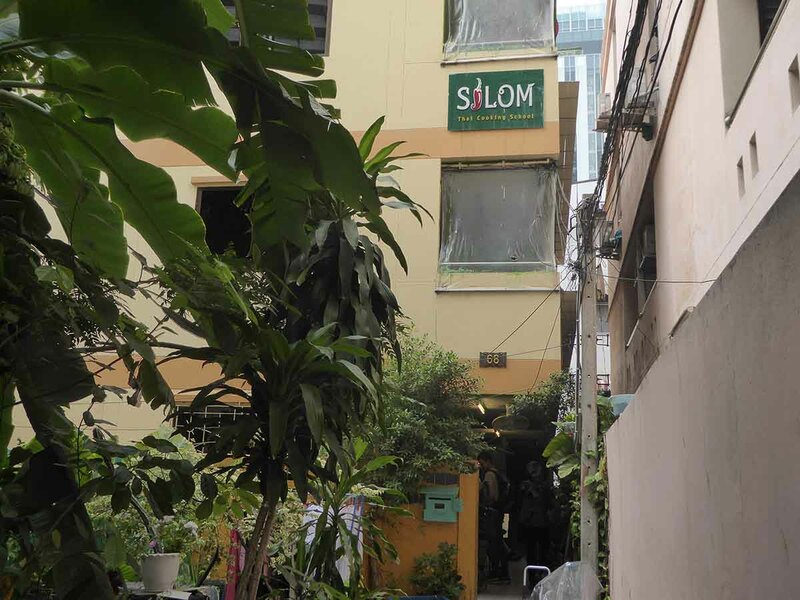 Turn left into Silom road, Soi 13 is on the left after about a 10-minute walk. Silom Thai Cooking School is a traditional outdoor kitchen. There are 3 classes per day, in the morning from 09.00 to 12.20, in the afternoon from 13.40 to 17.00, and in the evening from 18.00 to 21.00. The morning and afternoon classes include an outdoor market tour with the instructor to find and shop for the cooking ingredients while the evening class includes a display of fruit, vegetables, herbs, and spices from the market. The classes cost 1000 baht per person including all ingredients, refreshments, and recipes. The students prepare and cook a full 5-course meal after learning how to make pastes. The menu features 5 different dishes each day on two levels, beginners and students who have already completed the beginners class. The classes are small and limited to no more than 9 people with qualified instructors. The cooking is done with traditional utensils and techniques. The class ends with a meal where you get to eat the food you have cooked. There is also a special vegetarian only cooking menu and class available on demand. Location: 68 Silom Road Soi 13, Bangrak. 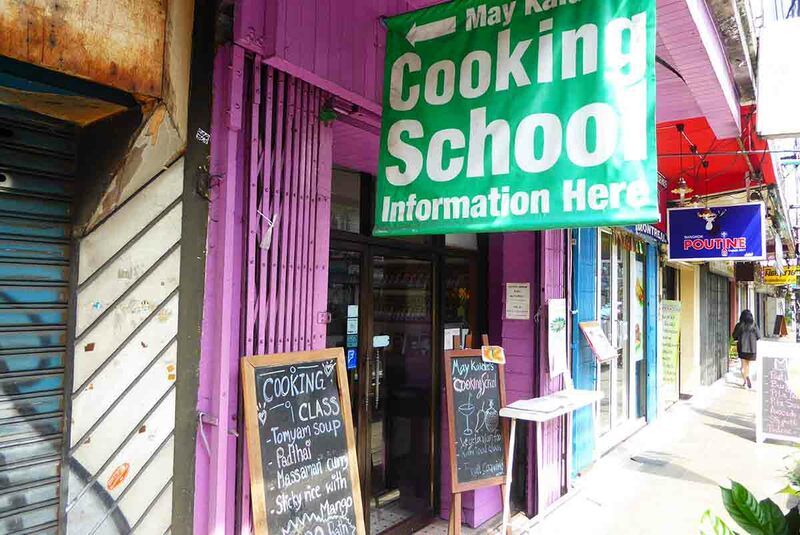 May Kaidee’s Cooking School is near to Khaosan Road and offers classes in cooking Thai vegetarian and vegan food. There are 2 classes per day in the morning and afternoon. The morning class is from 09.00 to 13.00 and the afternoon class is from 14.00 to 18.00. Classes are suitable for both beginners and experienced chefs and include an introduction to Thai vegetables, fruits, herbs, and spices followed by instruction in the preparation and cooking of 8 recipes overseen by qualified instructors. There is also further instruction in the preparation of several raw and cold food recipes such as papaya salad and spring rolls. The cost of the class is 1500 baht including all ingredients, refreshments and a special course notes booklet including recipes. Longer courses and special classes in fruit carving, paste making, tofu making, and raw food preparation are also available starting at 1800 baht per person. May Kaidee run several restaurants both in Thailand and Internationally. Bangkok restaurants are in both Samsen Road and Tanao Road. The cooking school and restaurant is on Tanao road just behind Burger King. Getting There: Walk from Khaosan Road.